Four days after the Federal Government shut down the annual National Fallen Firefighters Memorial Weekend was supposed to occur at the FEMA training facility in Emmitsburg, Maryland. The touching event was not going to be cancelled but it had to move. Plan B was to go to the venues on standby for inclement weather. The memorial service was held at the neighboring basilica of the National Shrine of St. Elizabeth Ann Seton. The above photo was taken by Peter Roof with “Mosquito One” remote controlled quadcopter. The memorial service was moved to the athletic center of Mount St. Mary’s College, the site of last year’s service since rain moved that event indoors. Every October, the Foundation sponsors the official national tribute to all firefighters who died in the line of duty during the previous year. Thousands from around the nation attend along with many of the families who lost a loved one in the previous year. This is the fifth year that Peter Roof was operating a hand-held covering the two memorial services. 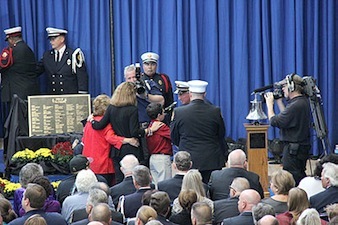 He can be seen in the nearby photo at right taken by Claudia Garner for the National Fallen Firefighters Foundation. Production Manager Spruce McRee had a family emergency and was not on location. Despite these challenges the crew was able to pull off an emotionally moving production. The program was shown on a large screens in the venue plus sent live on two satellites and streamed on the web.